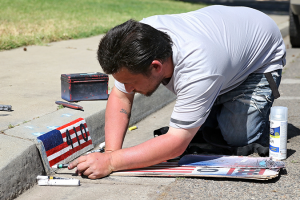 Morgan Jimenez paints one of his curbside patriotic designs for a member of the community. Armed with just a roll of tape, some newspapers, spray paint and stencils, Morgan Jimenez is making his mark on the streets of Turlock, much to the delight of the city’s most patriotic residents. The 37-year-old Turlock native has put his own personal spin on curb address painting, helping homeowners ensure their house number is visible from the street with the help of an American flag. Walking door-to-door, the artistic entrepreneur has painted close to 100 flags with address numbers on curbs throughout town — and he’s just getting started. Jimenez and his brother used to paint simple, black and white addresses on curbs years ago, he said, but this time around, he wanted to do something out-of the-ordinary and eye-catching for Turlock residents. Jimenez uses tape to create the flag’s stripes, but as for how he creates the stars? “It’s my secret method…I don’t want to give it out too easily,” he said. Business has picked up for Jimenez since his talents were posted to Facebook by a customer, he said — a post which has since accumulated over 100 shares. He’s even been called to paint the curbs of homes in Modesto. Jimenez charges $25 for his U.S.-themed address paintings, and also provides black and white curbside addresses for $10. The Bayou Bar & Grill offers Central Valley patrons an authentic taste of New Orleans. When you think of Southern cuisine in California, Modesto probably won’t be the first place that comes to mind. Better known for George Lucas than jambalaya, the city now has some of the New Orleans spirit stuffed into a restaurant on 13th Street, giving food lovers a flavor that is lacking in the Central Valley. Mark Nelson, a personal injury attorney based in Modesto, loved visiting New Orleans and admired the city so much that he decided to bring some of it back home with him. He opened The Bayou Bar & Grill on April 1 2017, and when it arrived there was nothing like it anywhere around. Sure, you could probably track down a Po’Boy sandwich or some gumbo if you were patient enough and had some extra gas in the tank, but to have a Big Easy themed restaurant that combines vibe and unique regional dishes in one spot is a bit different. Starting a business that focuses on a style of food most Valley residents might not be familiar with may seem like a gamble, and for a while after the doors opened it looked like just that. It took some time for the Bayou to find its identity and to establish itself as more than just a gimmick. The masks on the walls adorned with feathers and rhinestones, the colorful beads draping the chairs, the tall slender jazz figurines that greet visitors upon entrance, all of it means nothing without authentic Southern cooking to back it up. At first, The Bayou wasn’t doing as well as Nelson had hoped, so he knew that changes had to be made if it was to be successful. That’s when he hired Heather DeShaw, who has 15 years experience in the culinary world, to take over as general manager in December. A new chef was hired and a new menu was released and business began increasing. And the food is definitely the reason patrons keep coming back. “A lot of people think that because we’re landlocked in the Central Valley we don’t have access to fresh items, but those trucks move over the hill (from the Bay) pretty quick,” DeShaw said. They get fresh fish lists every day, showing what’s stocked on the docks in the morning. The Pacific Ocean is a rich source of shrimp, and they get renewed shipments of seafood at least twice a week. Their oysters have a much longer journey though, making their way here from the eastern coast of Canada. DeShaw says she gets compliments from New Orleans natives on how the Bayou captures the soul of Southern cuisine. Some have even compared their beignets to the famous Café Du Monde’s, a Big Easy feature since 1862. And it’s the menu, simple yet strong, which is at the center of it all: Po’Boy sandwiches, fresh oysters, chicken or shrimp jambalaya, gumbo packed with shrimp and andouille sausage, alligator bites, and a new Mardi Gras salad with house-made cranberry rum relish that DeShaw says is awesome. “The flavor profile is amazing…it just dances all over your mouth,” DeShaw said. 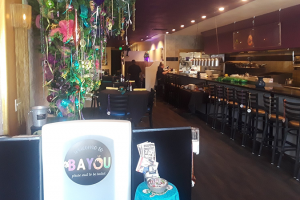 In addition to providing great grub for those who come in and sit down for a bite, The Bayou also participates in events that can showcase their talents as well as raise awareness for causes. The One Table Community Dinner, which takes place on May 6 at 15th St. and the McHenry Mansion, helps benefit United Way of Stanislaus County. The Bayou Bar & Grill will serve their appetizers, and the more than 300 guests who attend and eat at the block-long table will also get to sample the flavors of other local chefs. They are also volunteering for Pirate’s Day, held for Modesto Junior College students, where they will give a taste of their menu to those who no doubt could use some free samples. With word of mouth spreading like Louisiana hot sauce, it’s no wonder The Bayou figures to be part of the downtown culinary landscape for the foreseeable future. 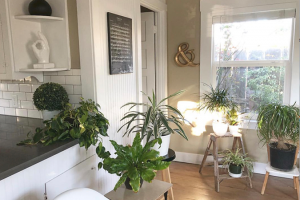 Rebecca Prendez turned her at-home hobby of organization into a business, helping others turn their cluttered quarters into peaceful spaces. Rebecca Prendez has always found decluttering and organizing to be therapeutic, and now she’s turned her hobby into a business that makes the stress of cleaning up just a little bit easier for Turlock residents. Prendez’s professional organizing business, Peaceful Spaces, stems from a childhood which saw her grow up in a household with seven children. Her parents kept a neat home, she said, which taught her the skills of keeping an organized living space. Peaceful Spaces began when Prendez’s friends told her that she made the overwhelming task of getting organized so much easier. Now, she has helped countless people with the challenge, working side-by-side with clients to sort, purge and organize even the most cluttered of homes. Prendez helps clients in whatever areas they need help — she can help create a filing system for important documents or family photos, she will haul away any unwanted items to the nearest donation center and she even shops for organizing supplies. She has also helped clients out by re-selling any items they don’t want but would like to make a profit from on sites like Craigslist, Facebook or Offer-Up. Prendez’s top tips for those hoping to reorganize their living spaces include the rule of, “one thing in, one thing out,” which asks the organizer to let go of something in their home every time they bring some new in. “Whatever it is; if you buy a new white shirt then let go of that old white shirt. If you buy a new set of sheets, it’s okay to say goodbye to the old set,” Prendez said. She also encourages people to only keep what they love and what is essential, rather than keeping things around their home that don’t bring them any joy. Prendez is available by appointment (afternoons and weekends) for complimentary consultations and regular sessions. to plant in the garden. Business is blooming at Morris Nursery in Riverbank. 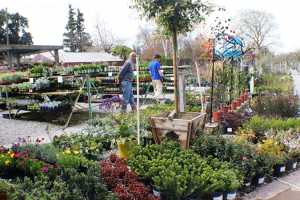 A well-known full service nursery in the 209, owner Ron Hoffmann said March, April and May are the busiest months for the business, which is situated along Patterson Road (Highway 108) just west of Riverbank. Hoffmann has been involved in the business for years, starting out as a ‘water boy’ while still in high school and climbing the ladder through multiple positions within the nursery industry before eventually purchasing Morris Nursery. A graduate of Davis High School, Hoffmann also did some college classes at both Modesto Junior College and Stanislaus State, but said much of his ‘schooling’ came on the job. He started his career working for Floyd and Betty Zaiger at Zaiger’s Nursery in Modesto, now Westurf Nursery. Originally interested in pursuing a career in mechanical engineering, Hoffmann said that career choice was left behind when he joined the FFA in high school. “It changed my goals,” he said of his involvement in the agriculture-focused organization. The nursery covers about 2½ acres along the highway and nearly two acres are covered with plants, trees, garden art, fountains and more. They also have an extensive gift shop with hard-to-find items. “We carry a lot of unique things,” Hoffmann said. Morris Nursery’s showroom has plenty of options for shoppers looking to decorate inside and outside. It hasn’t always been an easy row to hoe in the nursery business, especially when people got used to “going to chain stores” for plant needs but Hoffmann said he is seeing a change. “There’s such a move on now for people to grow their own food, they are realizing that fresh vegetables and fresh fruits are good for you,” Hoffmann said. 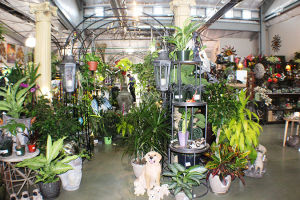 Morris Nursery is literally a ‘one stop shop’ for those needs, the owner added, with plenty of fruit trees and seeds for the garden available, as well as ornamental trees, flowers and plants to bring that needed curb appeal or to create a custom backyard oasis. Offering garden and landscape design, master nursery professionals to answer all your questions and featuring classes on topics from planning a summer vegetable garden to orchid care, there are plenty of ways to learn and do at the shop. Along with Hoffmann as the owner, the professional staff includes General Manager Dave Provost, Assistant Manager/Creative Design Director Cynthia Austin Tanis, Bedding Manger Jaci Ideus, Assistant Giftroom Manager Kathy Stepp and Horticulturist and Landscape Designer Jadwiga Hoffmann. Ron Hoffmann served as manager at Morris Nursery for several years before purchasing the business from former owners Bill and Sharon Morris in 1996. He still leases the land from them. Along with the retail side of the nursery that Hoffmann purchased, there is also Morris Wholesale Nursery, which he doesn’t own, that deals more with landscape contractors and professional designers. It is adjacent to the retail store but is a separately owned business. As far as the best part of the job? Morris Nursery is turned into a virtual Winter Wonderland for the holidays, making it very much a ‘must see’ on the holiday list with several rooms decorated for the winter season and Christmas. Hoffmann said he and the staff at Morris Nursery take pride in being able to help customers with a variety of issues, concerns and projects. Whether it’s someone looking for help designing a small or large yard, getting answers on what plants will fare the best in the Central Valley summers or someone looking to get into gardening, the answers can be found. And staying busy is what makes Hoffmann and his staff the happiest, since they know they are helping meet a specific need for each customer that walks through their doors. “To get good quality, come to a nursery where people know what they’re doing,” Hoffmann said. 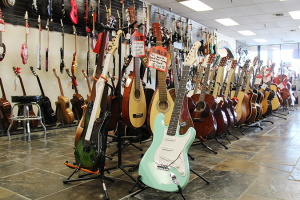 Monday through Saturday, 8:30 a.m. to 5:30 p.m. Sunday, 9 a.m. to 5 p.m.
Dale’s Guitar and Music Lessons has moved into a new, spacious location on Geer Road, allowing the store to replace its stacks of instruments with neat, organized displays. Dale’s Guitar and Music Lessons has called Turlock home for over a decade, but a fresh start for the business in a new location is proving to be a success for owner Dale Falkenberg just one month in. The music store had previously sat on East Olive Avenue in the same building which formerly housed Jura’s Pizza Parlor, but renovations on the building forced Dale’s Guitar to move. Falkenberg was given 45 days to move his business and ultimately settled on the spacious location that the store is in now, right next to Angelini’s Italian Restaurant on Geer Road. The move from the small, cramped quarters on East Olive Avenue into the store’s large new 4,500 square-foot space has been beneficial for business, Falkenberg said. While Falkenberg was sad to leave his business’ first home – he and his children built it “from the ground up,” he said – the shop’s new location provides not just more space, but better parking and an environment filled with other busy businesses, which Falkenberg has missed since Jura’s moved from North Golden State Boulevard. Foot traffic from neighboring stores has increased sales for the store since the move – something Falkenberg didn’t expect. There’s room for every instrument at Dale’s Guitar now, which is a big deal given the circumstances at the store’s old location. Stacks upon stacks of music books, guitars, violins and other musical instruments were created to make up for the lack of space, and customers often were unable to find what they were looking for. Now, neat rows of inventory on display by type and brand combine to create a small-scale warehouse atmosphere, where customers can spend all day looking at different varieties and styles of their favorite instruments. “We’re selling more because we have more space and people can actually see what we have to offer,” Falkenberg said. 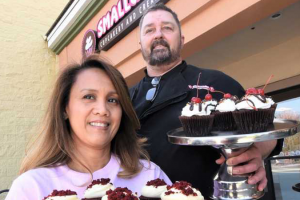 The Smallcakes Bakery is enjoying success in Ripon next to the Save Mart supermarket on Colony Road just north of Highway 99 with its offering of daily-made specialized cupcakes and homemade ice cream selections. Maijil and Charlie Brunet had a soft opening last month with customers flocking into their front door and selling out every day but one. That one day they took what leftovers they had down to the police and fire departments and to Bethany Home. A kitchen staff of six pastry chefs are early risers in the cupcake shop before dawn every morning. He noted that his wife Maijil came to the U.S. in 2008 from her native Philippines. She also works as a neonatal registered nurse at a Modesto hospital caring from preemies. They are parents to 8-year-old Charlie and 5-year-old Taylor who was born with downs syndrome who works with his brother behind the counter folding gift boxes and meeting with the adult customers. He added that education and work ethic are very important to both of them and their boys are learning those traits through their times at the bakery. Little Charlie has planted his own garden at home since he was four and the neighbors up and down the street have gotten his cherry tomatoes delivered to them on a regular basis, he added. Charlie attends Colony Oak School and Taylor will be joining him at that campus next year. Charlie Senior is retired from the U.S. Army. 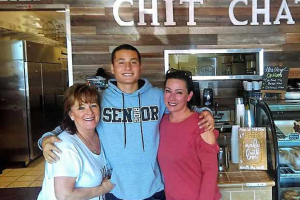 From left, Patty Benbrook, Adrian Saucedo Jr., and Tiffany Saucedo, owner of the Chit Chat Cafe and Bakery in Manteca, enjoy some family time on Monday. Earlier this year, Tiffany Saucedo opened Chit Chat Café and Bakery in the Orchard Supply Hardware shopping center in Manteca. It was an idea borne out of her not-too-long-ago days of doing private tea parties – she was the owner of Tiffany’s Royal Tea Party – that, much to her surprise, quickly found a clientele. Thanks to social media and word of mouth, Chit Chat had become a hidden gem. Don B. on Yelp went so far as to call the business at 273 W. Louise Ave. as a great “hole in the wall” in his review posted shortly after the January opening. “The selection of pastries is a great variety,” he said, referencing the scones, bagels, and banana bread, to name a few. But it’s the cinnamon rolls that’s been all the rave. “Our pizzas and cinnamon rolls are No. 1,” said Saucedo of the two top sellers thus far. Chit Chat makes personal-sized pizzas, offering an all-meat, Margherita, vegetable, pepperoni, cheese, and barbecue chicken while cooked up in an imported Italian stone oven. Coffee is a big part of Chit Chat. The quaint setting here is the ideal for folks to sit back, relax, and chit chat; hence the name, according to Saucedo. “I was also known to chit chat a lot in school,” she jokingly added. The decor has plenty of personal touches. For example, the wood panels behind the Chit Chat counter were that of the old Saucedo family backyard fence but with some special treatment. Tiffany’s father did plenty of the interior work including building the benches. Her mother, Patty Benbrook, works in the kitchen as does daughter Dominque, who is the barista, and Adrian Jr., who helps make crepes on Saturdays, from 7 a.m. to 2 p.m. He and Adrian Sr., Tiffany’s husband, whip up savory and sweet crepes on that one day of the week. Chit Chat has been a family endeavor and about seven years in the making. “Her heart is still in doing tea parties,” said Tiffany’s mother Patty. Saucedo does have plans to do just that again, using her business as the setting while teaching proper etiquette of the tea scene. Back to the food scene, Chit Chat currently makes one sandwich, a chicken breast sandwich served up with a roasted Ortega chili and pepper jack cheese, and on bakery-fresh ciabatta bread. There’s also one salad. But this one could be had with chicken and a choice of blueberry or raspberry balsamic vinaigrette dressing from Manteca’s own Olive Oil Pantry. “We’re still a work in progress,” Saucedo said. Her hope is to make Chit Chat a comfortable place for people to relax and just talk sans cell phones and other hi-tech devices. “Our No. 1 goal is for people to feel better when they leave here,” said Saucedo. For more information, call 239-5724. 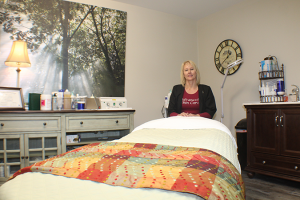 Joan Sneed is right at home in her new location, at 1930 Main in Escalon, where she operates her Advanced Skin Care business. Moving her business a couple of blocks, Advanced Skin Care owner Joan Sneed is now located at 1930 Main St., Escalon. It wasn’t a far distance, having previously shared a space at 1710 Main, but she felt the time was right to strike out on her own. Now, she and Nails by Beth are in the new location and Sneed said she is happy with the move. Her shop is in a former CPA office on Main Street and sharing the location with the nail business has been good, she added. “I’ve been in business in Escalon for 10 years,” Sneed explained, and previously shared space with Basics Salon. She was in business for 15 years before that in Modesto and said it’s amazing that she has already been in the Escalon downtown area for a decade. “I can’t believe it,” she said, adding that she has a very loyal clientele and loves helping people look and feel their best. Open Tuesday, Wednesday, Thursday and some Saturdays, Sneed said she is always busy. She attended Adrian’s Beauty College and also did specialized training in such diverse locations as Beverly Hills and Monterey as well as studying with a well-known doctor in San Diego. Her clients include many from San Joaquin County as well as the communities of Hughson, Riverbank, Oakdale, Madera and more. She is getting set up for a new microblading service and does facials, waxing, microdermabrasion, hydrafacials and more. “I love the fact that I can change the skin, make it beautiful,” she said. Sand County Foundation, the California Farm Bureau Federation and Sustainable Conservation are accepting applications for the $10,000 California Leopold Conservation Award. The award publicly honors California farmers, ranchers, foresters and other private landowners who demonstrate outstanding stewardship and management of the state’s natural resources. Nominations must be postmarked by July 13 and mailed to California Leopold Conservation Award c/o Sustainable Conservation, 98 Battery Street, Suite 302, San Francisco, CA 94111. The award will be presented in December in San Diego. The California Leopold Conservation Award is possible thanks to generous contributions from many organizations, including Farm Credit West, American AgCredit, The Harvey L. & Maud S. Sorensen Foundation, The Nature Conservancy, and Leopold Conservation Award Alumni. For application information, visit leopoldconservationaward.org. River Islands will be expanding their recreational activities to include more sports. River Islands is setting a new standard for living, working, and playing in the Northern San Joaquin Valley. It is not simply reshaping Stewart Tract — the southeastern most islands in the vast San Joaquin-Sacramento Delta — into a planned community of 11,000 homes. 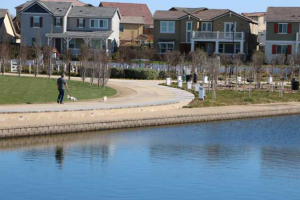 They are breaking the mold in terms of planned community standards in Northern California. And they are doing so by making adjustments as they roll out the basic development master plan. The latest change is a decision to add a regulation lighted high school baseball field at the base of the Bradshaw Crossing bridge across the San Joaquin River. The goal is to have the field ready by fall and to match the amenity standard in terms of seating and such that you can find at the nearby Big League Dreams sports complex in Manteca. Next door to it is where Cambay Group plans to break ground soon for a six-field soccer complex River Islands has entered into a partnership with John Doyle who is the director of the coaching staff for the highly-regarded Mustang Soccer League that’s based in Danville and is known for their elite club play. Doyle’s storied playing history includes the Olympics, historic firsts for the United States in the World Cup, and a distinguished Major Soccer League career that included five years as the San Jose Earthquakes team captain as well as a stint as general manager. He will be bringing the Mustang program to River Islands. When it is up and running, it will be open to youth players throughout the area. The sports complexes are part of a dual approach Cambay Group is using in developing recreation facilities. Some of it will be overseen by Lathrop Park and Recreation while some will be under the umbrella of River Islands. The arrangement allows for maximum flexibility. The soccer fields, as an example will be replaced by retail that expected for years down the road. Neither was in the original plan per se for River Islands but they underscore how Cambay Group is dedicated to constantly looking for ways to modify development of the planned community on 4,800 acres. It also underscores their effort to have River Islands serve as a major catalyst for the 209 region to set new standards for community development. The 18-mile greenbelt park that will ring the development was always part of the plan. But as development started, River Islands opted to go a step farther. They decided to add bridges across the three major streets that ultimately would have interrupted the trail with one already in place where traffic crosses the San Joaquin River at Bradshaw Crossing. That means when the development is completed, you will be able to travel the entire 18-mile green belt loop with River Islands on one side and the waters of the San Joaquin River, Old River, and Paradise Cut on the other side in a continuous path that will never cross a street. For urban green belts that is a first. There is no greenbelt in the Bay Area that can make that claim. Even the highly popular 23-mile American River Parkway in Sacramento is chopped up with several crossings for vehicles although they are, for the most part low key when it comes to traffic volume. Like the American River Parkway and the extensive web of similar trails around the Bay Area, the River Islands greenbelt is open to anyone. It will have the highest degree of public access for taking in the San Joaquin River anywhere along the 366-mile waterway — that is California’s second longest river — except for where it flows through national forest in the upper reaches of the Sierra. Unlike the American Parkway and trails in the Bay Area, not a penny of the work to make the access possible will be on the public’s dime although they will benefit from it. The greenbelt will be further enhanced by a recent decision to build extensions of the 300-foot wide super levees that have set the platinum standard for flood protection in California, back further behind existing older levees. When final federal clearance is given, the older levees will be knocked down and soil spread back toward the new levee. This will create an elevated bench that will allow for the restoration of habit that was virtually wiped out when levees were put in place more than 150 years ago. At the same time it will increase additional areas for water to go during high river flows to enhance flood protection for upstream neighbors of River Islands.